This kukri is the perfect fit for light chopping or carving. 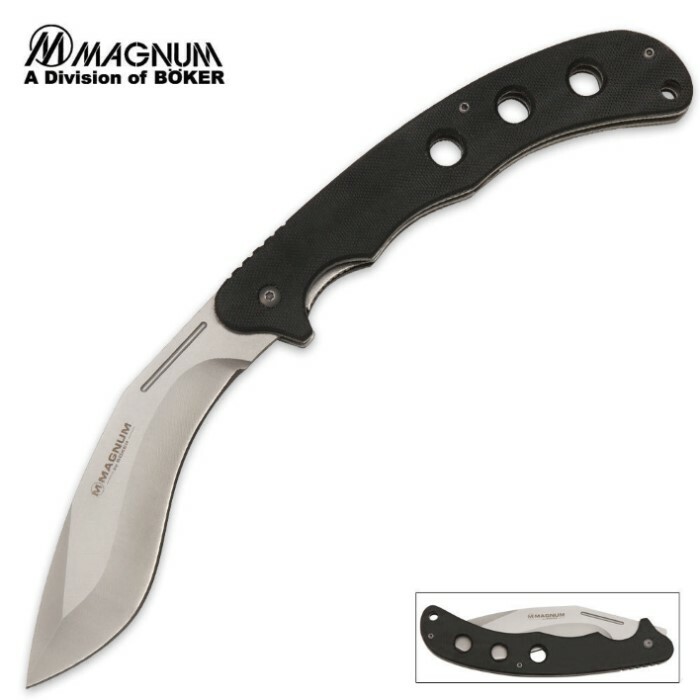 Featuring a 440 stainless steel blade and a G-10 handle with stainless steel liners, this is a solid piece with rugged grip. Includes a lanyard hole. 4 5/8 in. blade, 10 3/8 in. overall. This was a spot and buy for me. The day I pulled it out of the box I could shave with it and it felt solid. After three days of opening and closing for usage I notice the screws were coming loose, so after some blue lock and some adjustments I can now use this for a reliable work/defense blade. It is great. The folding out is a little bit slow but it can be used for many purposes. This knife was a great surprise for how much it was. Normally if you spend 20 on a knife you are receiving a lower quality product. That is not the case with this knife. The blade has a great weight and balance with the curve sharp enough to shave my arm hair right off. Just got it out of the box so will update after some use in welding shop. ok the picture is a bit off. the knife is not as wide as pictured. when you flick it open hard the inline lock jams in a bit. now for the good it comes sharp. very well made. balanced perfectly for a daily use. good size. wish it had a belt clip. i say if you got room in you pocket buy one. my knife came in today. great knife great price i love you guys keep up the good work. Excellent knife for all occasions. I dont know if its just mine but its really easy to sharpen. It also has easy one hand opening for quick use. I took a milk jug filled with water outside and in one swipe the jug was a goner. Great knife. Recomend for everyone who likes kukris and wants a good knife all around. Good solid knife, not much edge but a few minutes with a file and diamond rod got it nice and sharp. Would have given it five stars if it came sharp otherwise great knife for the price. Nice looking blade, very intimidating and tough, BUT the blade is near impossible to sharpen and after a week I noticed how much blade play the knife had developed. The blade can be deployed with a simple wrist flick and you can hear a very intimating snap as the blade locks in place. I would give this knife 5 stars if it was easier to sharpen and had a tighter lock up.